Look What’s New at the Warner Library! Warner Library serves Tarrytown and Sleepy Hollow. There’s a big browsing section of what new books the library bought. This book I happened to come across and was happy that I did. With all color pictures, Carp lists the 101 best trains and accessories (in his opinion) that have been released in the postwar period. Though Lionel trains dominate the entries, there are other companies whose trains, like Gilbert and Marx, that make the list. Even Plasticville, known to anyone who has anything to do with toy trains, gets a plug as one of the best-created accessories. Each entry not only gives the history of the item being discussed, but some of the corporate history of the toy manufacturer that created it. Carp is the editor of Classic Toy Trains magazine, so he knows his facts. 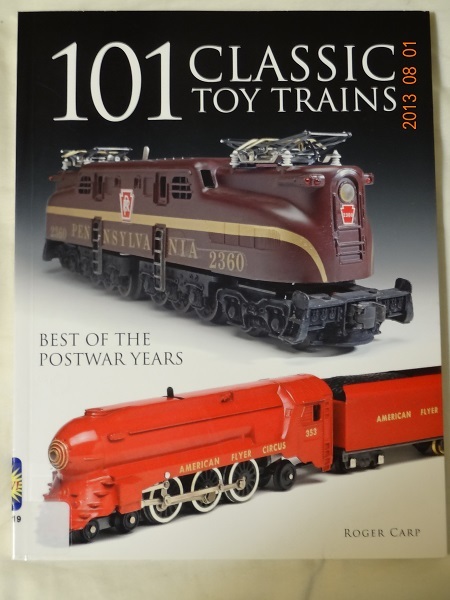 If you love toy trains, this is the book for you.